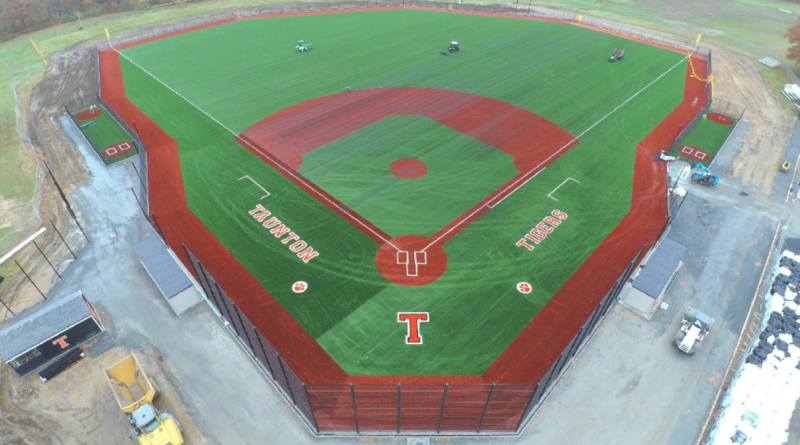 This past Saturday, Taunton High School hosted a grand opening weekend in honor of the brand new turf field that was constructed this past offseason. In the second game of the day, the Sharon Eagles took on the King Philip Regional High School Warriors. Starting on the mound for Sharon was 6’6 right handed pitcher, junior, Max LeBlanc and for KP was senior Stephen Murray. The two dualed throughout, resulting in a game which only saw the two pitchers on the mound as both of them went the distance. Leblanc went 7 complete innings allowing 1 earned run along with 5 strikeouts. Murray went 7 innings as well with 1 earned run and 6 strikeouts and allowing 8 hits. “Max pitched a great game, the bats came alive but it was a little too late. We definitely played better than against Milford. We’re moving in the right direction,” says senior second baseman and relief pitcher Ben Reinbold. “Max pitched an amazing game and he really did a great job of keeping us in the game and putting us in a position to win,” says senior right fielder Matt Jacobson. The scoring opened up in the second inning when KP capitalized on a Sharon error and went up 1-0. The two pitchers went at it until the 5th inning when the Warriors strung together some hits and a pair of costly errors from Sharon allowed them to take a 3-0 lead over the Eagles. In the 6th inning junior Alec Filipkowski got to second base on an error which allowed senior catcher, Jared Reef to score pulling the Eagles within two. Errors by KP allowed Sharon to load the bases in the bottom half of the seventh inning when Filipkowski sent a mile high fly ball to left field which allowed sophomore Justin Nault to cross the plate. “The game got real exciting towards the end when we loaded the bases up,but unfortunately couldn’t capitalize to get the win,” Reinbold added. But that is where the Eagles comeback would end as KP squeezes out a 3-2 win to improve to 1-1 on the year and the Eagles fall to 0-2. The Eagles look to earn their first win of the 2019 season as they travel to the 2-0 Mansfield Hornets on Monday.